Using a worldwide combination of diverse telescopes, astronomers have discovered that a giant galaxy's bursts of very high energy gamma rays are coming from a region very close to the supermassive black hole at its core. The discovery provides important new information about the mysterious workings of the powerful "engines" in the centers of innumerable galaxies throughout the Universe. The galaxy M87, 50 million light-years from Earth, harbors at its center a black hole more than six billion times more massive than the Sun. Black holes are concentrations of matter so dense that not even light can escape their gravitational pull. The black hole is believed to draw material from its surroundings -- material that, as it falls toward the black hole, forms a tightly-rotating disk. Processes near this accretion disk, powered by the immense gravitational energy of the black hole, propel energetic material outward for thousands of light-years. This produces the "jets" seen emerging from many galaxies. In 1998, astronomers found that M87 also was emitting flares of gamma rays a trillion times more energetic than visible light. However, the telescopes that discovered these bursts of very high energy gamma rays could not determine exactly where in the galaxy they originated. In 2007 and 2008, the astronomers using these gamma-ray telescopes combined forces with a team using the National Science Foundation's continent-wide Very Long Baseline Array (VLBA), a radio telescope with extremely high resolving power, or ability to see fine detail. 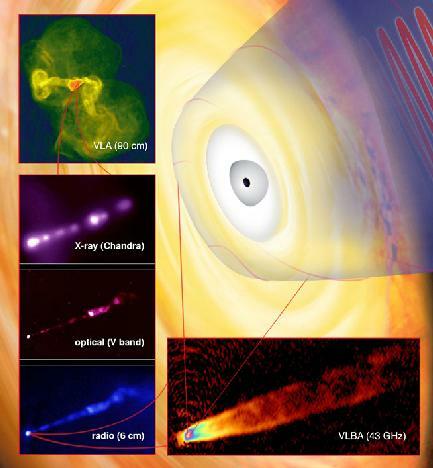 "Combining the gamma-ray observations with the supersharp radio 'vision' of the VLBA allowed us to see that the gamma rays are coming from a region very near the black hole itself," said Craig Walker, of the National Radio Astronomy Observatory (NRAO). "Pinning down this location addresses what was an open question and provides important clues for understanding how such highly energetic emissions are produced in the jets of active galaxies," said Matthias Beilicke, of Washington University in St. Louis, MO. The gamma-ray flares from the galaxy were monitored by systems of large telescopes designed to detect faint flashes of blue light that result when gamma rays enter the Earth's atmosphere. Data from sensitive cameras in these systems can allow astronomers to infer the energy of the gamma rays and the direction from which they came. Their directional information, however, is not precise enough to narrow down the gamma-ray-emitting region within the galaxy. The VLBA offered a millionfold improvement in resolving power, allowing the scientists to determine that the gamma rays are coming from the immediate vicinity of the black hole. Though gamma rays are the most energetic form of electromagnetic radiation and radio waves the least energetic, both often arise from the same regions. This was shown clearly when M87's most energetic gamma-ray flares were accompanied by the largest flare of radio waves seen from that galaxy by the VLBA. The radio flare began at about the time of the gamma-ray flares, but continued to increase in brightness for at least two months. "This tells us that energetic material burst out very close to the black hole, causing the gamma rays to be emitted and the radio flare to begin. As that material traveled down the jet, expanding and losing energy, the gamma-ray emission ceased, but the radio continued to increase in brightness," Walker explained. "The VLBA showed us with great precision where the radio emission came from, so we know the gamma rays came from closer in toward the black hole," he added. M87 is the largest galaxy in the Virgo Cluster of galaxies, at the center of a supercluster of galaxies that includes the Local Group, of which our own Milky Way is a member. The black hole in M87 has an "event horizon," from which matter cannot escape, roughly twice the size of our Solar System, or a tiny fraction of the size of the entire galaxy. The new measurements indicate that the gamma rays are coming from an area no larger than 50 times the size of the event horizon. The telescope systems that detected the gamma-ray flares are the VERITAS array in Arizona, the H.E.S.S. system in Namibia, Africa, and the MAGIC system on La Palma in the Canary Islands. The VLBA is a system of ten radio-telescope antennas stretching from Hawaii to the Caribbean, operated by the NRAO from Socorro, New Mexico. The VLBA offers resolving power equal to the ability to read a newspaper in New York while standing in Los Angeles. 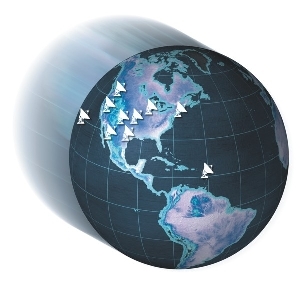 Walker and Beilicke worked with Fred Davies of NRAO and New Mexico Tech, Henric Krawczynski of Washington University, Phil Hardee of the University of Alabama, Bill Junor of Los Alamos National Laboratory, Chun Ly of UCLA, and large research teams from VERITAS, H.E.S.S., and MAGIC. The scientists reported their findings in the July 2 online edition of the journal Science.